This page covers the author of Weaveworld. For other authors named Clive Barker, see the disambiguation page. Come join our crypt-keepers, Joe and Steven, every third Tuesday of the month with our horrific book club, The Nightmare Factory. This month's book is Hellbound Heart by Clive Barker. The NIGHT OF THE LIVING BOOK CLUB will discuss The Great And Secret Show by Clive Barker. H.P. Lovecraft said, "The oldest and strongest emotion of mankind is fear. And the oldest and strongest kind of fear is fear of the unknown." Come join our crypt-keepers, Joe and Steven, every third Tuesday of the month as we help you navigate the bloody byways and diabolic depths of your fears with our horrific book club, The Nightmare Factory. This month's book is Books of Blood by Clive Barker. Clive Barker's book Mister October, An Anthology in Memory of Rick Hautala was available from LibraryThing Early Reviewers. 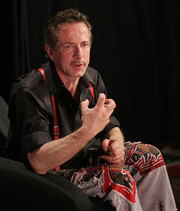 "Clive Barker" is composed of at least 3 distinct authors, divided by their works. You can edit the division. Clive Barker is composed of 11 names. You can examine and separate out names.